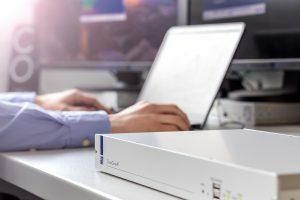 Together with a series of IP extenders, the ControlCenter-IP forms a powerful matrix with which any connected operator station can be granted access to any remote computer. Thus, operators benefit from the full performance of their computers even when operating them remotely and but yet in real time. While the network infrastructure takes over the transport of KVM-over-IP™ using network switches and routers, the ControlCenter-IP contributes the logic. Transmission takes place compressed via CAT cabling or optical fibres via standard IP-based networks on layer 3, with a data transmission rate of 1 Gbit/s per line. 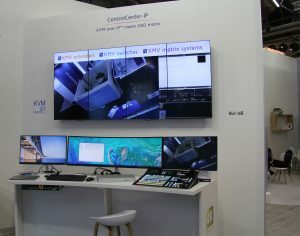 The ControlCenter-IP system provides pixel-perfect images and uses the in-house compression technology HDIP. This compression mode allows the loss-less transmission of video signals with a resolution of 4K at 60Hz. 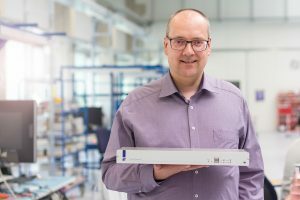 Thanks to this technology, the systems require less bandwidth to transmit signals – but still provide crystal-clear images and latency-free operation. 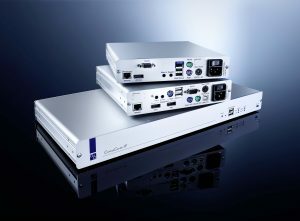 In combination with IP extender solutions for DP1.2a and DP1.1a as well as single link and dual link DVI, a wide range of video signals and resolutions up to real 4K over IP is supported. The ControlCenter-IP supplements the series of Vision-IP of G&D with a variety of matrix functions. These functions use G&D‘s KVM-over-IP™ for the transmission of signals. The transfer takes place under compression via standard IP-based networks (OSI layer model 3) and a Gigabit Ethernet. Using bandwidth management, the user can adjust the transmission to a variety of bandwidth requirements. The transmission length is almost unlimited, two active network components can be connected to each other over a length of up to 100 m via CAT or optionally also via fiber optic cabling (up to 10 km depending on the variant).